Genuine Jersey member Elke Jacques from Flavour.je sent us this recipe for a summer salad using delicious local produce, along with her favourite sources for ingredients. Cook beans for 10 mins, drain and sit in cold water. Drain beans again, dry them and pop them out of their jackets. Sprinkle a little salt and drizzle some fresh lime over the beans, shake to mix and set aside. Chop little gem and spinach, rinse, dry, then toss in olive oil, lime juice, crushed black pepper a little more salt and grated parmesan. Chop or tear some basil into small shreds and mix with beans, add a little olive oil. 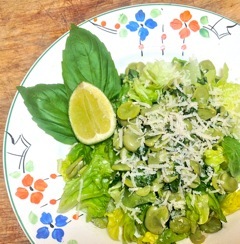 Place salad leaves on a plate and spoon the beans over the top. Add more grated parmesan and black pepper, to taste. Alternatively, adding chopped red chilli works really well too. Delicious served with toasted multi seed bread. Thanks for the recipe, Elke!